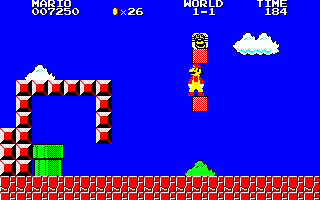 World 1 is the first world in the game Super Mario Bros. Special, located in the Mushroom Kingdom. The world is largely similar to World 1 from the original game, although there are major differences, mostly the levels being longer. The world is located mostly in a grassland setting. World 1-1 The first course in the game. The main enemies in this course are Little Goombas and Koopa Troopas. A Hachisuke can be found here near the end of the level. World 1-2 The first underground course in the game. Unlike World 1-2 from the original game, it does not have a Warp Zone, and the Coin Room leads to an outdoors section which is normally not accessed if players take the normal path. World 1-3 The first treetop course in the game. It contains a few Koopa Paratroopas, and is significantly longer than World 1-3 from Super Mario Bros.
World 1-4 The first castle course in the game. It features many Fire-Bars. Unusual for castle levels, this castle includes an underground Coin Room. Mario in the underground passage of 1-1.